Identify and explain the three important parts to a radiographic film. Summarize the basic process of developing film. To understand how the image on a radiograph is formed, we need to first look at the characteristics of the film itself. There are three important parts to a radiographic film. These include the base, the emulsion, and the protective coating. All radiographic film consists of a base for which the other materials are applied. The film base is usually made from a clear, flexible plastic such as cellulose acetate. This plastic is similar to what you might find in a wallet for holding pictures. 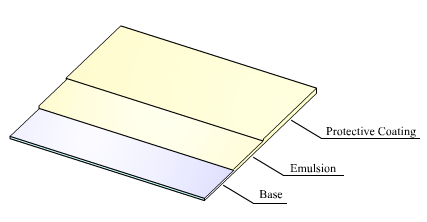 The principle function of the base is to provide support for the emulsion. It is not sensitive to radiation, nor can it record an image. The clarity or transparency of the film base is an important feature. Radiographic film must be capable of transmitting light. Once a film has been processed chemically, it is subject to interpretation. This is commonly done by using a film illuminating device, which is usually a high intensity light source. The film emulsion and protective coating comprise the other two components and are essentially made from the same material. They are applied to the film during manufacturing and usually take on a pale yellow color with a glassy appearance. Although they are made from the same material, they offer two distinct features to the film. These features are separated into the image layer of the emulsion, and the protective layer. The protective layer has the important function of protecting the softer emulsion layers below. It is simply a very thin skin of gelatin protecting the film from scratches during handling. It offers very important properties to film manufacturers, which include shrinkage (during drying that forms glassy protective layers) and dissolving in warm water. It will absorb the water and swell if it is dissolved in cold water. The softer layers of the gelatin coating are technically known as the emulsion. An emulsion holds something in suspension. It is this material in suspension that is sensitive to radiation and forms the latent image on the film. During manufacturing of the film, silver bromide is added to the solution of dissolved gelatin. When the gelatin hardens the silver bromide crystals are held in suspension throughout the emulsion. Upon exposure of the film to radiation, the silver bromide crystals become ionized in varying degrees forming the latent image. Each grain or crystal of silver bromide that has become ionized can be reduced or developed to form a grain of black metallic silver. This is what forms the visible image on the radiograph. This visible image is made up of an extremely large number of silver crystals each is individually exposed to radiation but working together as a unit to form the image. Once a film has been exposed to radiation and possesses the latent image, it requires chemical development. The purpose of developing the film is to bring the latent image out so that it can be seen visibly. There are three processing solutions that must be used to convert an exposed film to a useful radiograph. These are the developer, stop bath, and the fixer. Each of these solutions is important in processing the image so that it may be viewed and stored over a period of time. 1. To begin the process of converting the latent image on the radiograph to a useful image we first expose the film to the developer solution. The developers purpose is to develop, and to make the latent image visible. A special chemical within the developer solution acts on the film by reducing the exposed silver bromide crystals to black metallic silver. This process of developing is actually a multi-step process. Recall the characteristics of the film manufacturing mentioned earlier, they become important in the development process. Before the developer can change the silver crystals it must penetrate the protective coating of the film. Keep in mind that the protective coating of the film is made of gelatin and is sensitive to temperature and water. The developer solution is comprised of a combination of chemicals, consisting of alkali and metol or hydroquinone mixed with water. The purpose of the alkali is to penetrate the protective coating allowing the metol to reduce the exposed silver bromide to black metallic oxide. 2. The second step in the development process is the stop bath. This bath is comprised of a glacial acetic acid and water. It is important to recognize that alkalis and acids neutralize each other. The function of the stop bath is to quickly neutralize any excessive development of the silver crystals. Over development of the silver crystals results in a radiographic image that is virtually impossible to interpret. 3. The third step in development is the fixer. Its function is to permanently fix the image on the film. This is also a multi-step process. The fixer must first remove any unexposed silver crystals and then harden the remaining crystals in the emulsion. It is this process that is used to preserve the radiographic image over time. 4. Once the film has been properly developed, it is then rinsed in water and dried so that it may be visually examined. The three main part to radiographic film are the base, the emulsion, and the protective coating. Steps in developing film include developing, stopping the developer, fixing, rinsing and drying.